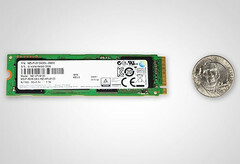 Two years after introducing NVMe SSDs for the server market, Samsung begins mass production of the first NVMe PCIe SSD for PCs and workstations with capacities up to 512 GB. Back in 2013, Samsung became the first company to launch 2.5-inch NVMe SSDs for the server market. Earlier this week, they announced that mass production of the industry's first NVMe PCIe SSD for PCs and workstations has begun. The drive uses the M.2 form factor and capacities available range between 128 GB and 512 GB. 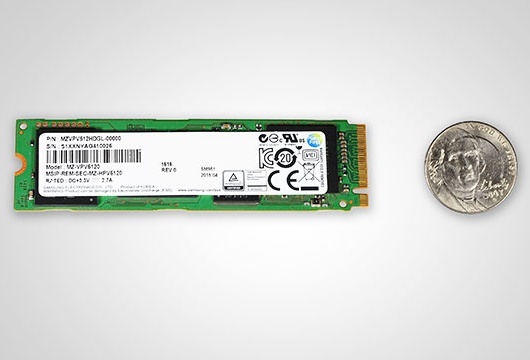 According to the official blog post by Samsung, "The new SM951-NVMe features the industry’s most advanced performance figures, exceptionally low power use in standby mode and the most compact size of any NVMe SSD." The Samsung SM951-NVMe drive is capable to reach 2,260 MB/s data reads and 1,600 MB/s while writing, far beyond the typical SATA-based M.2 SSDs that top around 540 MB/s and 500 MB/s, respectively. By using the four 8 Gbps lanes offered by the PCIe Gen 3.0 x4 interface, the SM951-NVMe has a data transfer rate of 32 Gbps and a maximum throughput of 4 Gbps. Additional performance figures of the SM951-NVMe include 300,000 IOPS for read operations, more than three times the 97,000 IOPS of SATA SSDs. The L1.2 low-power standby mode allows the new drive to use less than 2 mW in this state, about 97 percent less than L1, which requires 50 mW. Details on pricing and availability are not public yet, but we should hear more about the Samsung SM951-NVMe SSD in the months to come.